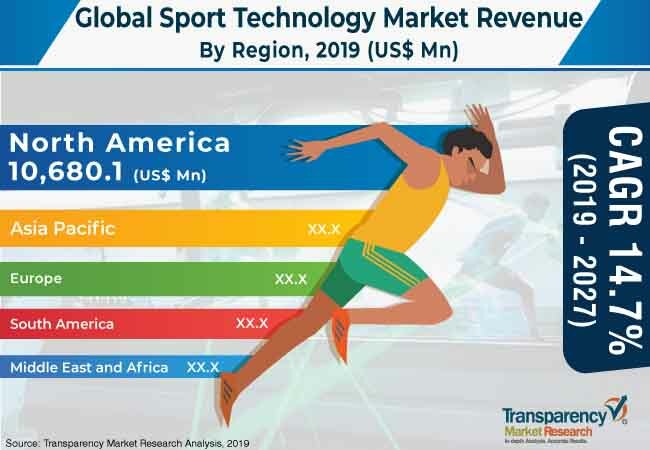 The global sports technology market has been segmented based on component, application, sport, end-user, and region. Based on component, the market has classified into software, wearable devices & sports equipment, and services. The wearable devices & sports equipment segment accounts for a key share in terms of revenue in the global sports technology market. This segment covers revenue generation from smart watches, fitness wearables, and health care tracking devices. However, the service (managed/outsourced) segment is expected to expand at a considerably higher CAGR of around 16.6% during the forecast period. Based on application, the market has been categorized into active (tracking, decision making) and passive (analytics & statistics, tactics & simulation, training, game performance analysis, team analysis & management, injury & health analysis). In terms of end-user, the market has been divided into coaches, clubs, leagues, sports association, others (athletes and sports person). In terms of sports, the market has been categorized into basketball, baseball, cricket, cycling, football, golf, rugby and others (swimming, badminton, tennis). The global sports technology market includes players such as Accenture, Catapult Group International Ltd., Chetu Inc., Firstbeat Technologies Ltd., IBM Corporation, Kinexon Precision Technologies GmbH, Krossover Intelligence Inc., Opta, Oracle Corporation, Orreco, SAP SE, SAS Institute Inc., SportRadar, STATS LLC., and Tableau Software Inc.